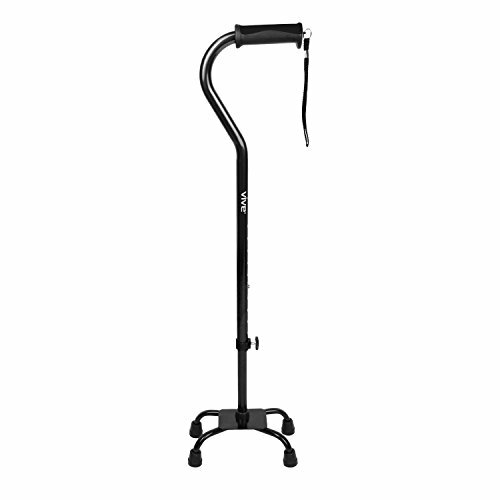 Safely navigate any surface with the Vive adjustable quad cane. Providing greater traction and stability on uneven surfaces, the quad cane uses a strong base with four prongs capped by non-marking, non skid tips. Easily adjust the height of the cane as well as the base for left or right handed use. A contoured handle provides a secure, yet comfortable grip on the lightweight, corrosion-resistant frame. Safely navigate over any surface, indoors and out. The quad cane base provides greater traction on smooth surfaces such as hardwood, laminate or tile floors as well as greater stability on uneven surfaces such as grass, sand, gravel or plush carpets and rugs. The versatile cane is made with a durable anodized aluminum frame that is adjustable from 28" to a maximum of 37" and supports up to 250 pounds. Easily switching from the left to right side, the four prong base locks into place providing additional support without interfering with a normal stride. Each prong is capped with a rubber, non skid, non-marking tip for added stability and convenience. The square base allows the can to stand upright while remaining compact enough to easily fit on stairs or in narrow passageways. Fitted with an ergonomically contoured hand grip, the cane handle creates a secure, yet comfortable grip perfect for daily use. The handle also includes a wrist strap for added convenience. Constructed with a durable anodized aluminum, the quad cane is lightweight and corrosion-resistant. Dual security features include an easy to grip locking knob and brass locking pin ensure that the cane stays at the set height without slipping. NONSLIP, FOUR-PRONGED BASE: Easily switching from the left to right side, the four prong base locks into place providing additional support without interfering with a normal stride. Each prong is capped with a rubber, non skid, non-marking tip for added stability and convenience. The square base allows the can to stand upright while remaining compact enough to easily fit on stairs or in narrow passageways.